As promised in our last newsletter, we have lots of exciting things in store for 2015. Check out our new product packaging along with the Technical Q&A and video links below. Enjoy! 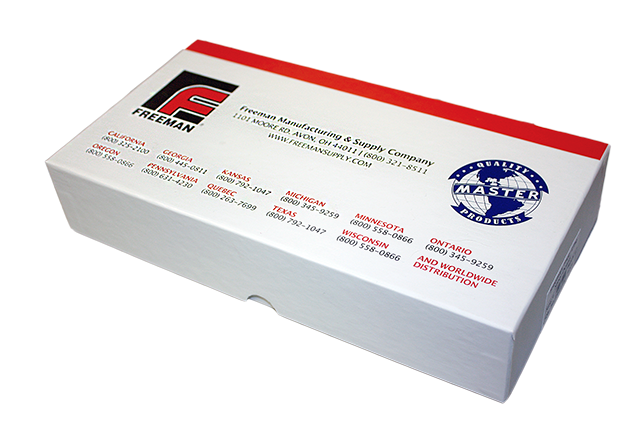 New packaging for our steel dowel lines (Freeman True-Line Steel, Freeman Square-Head Steel, and Master Sure-Lock Steel) brings a fresh look, easy identification and improved product security. Each newly designed, colorful box features labels on both ends specific to each dowel. Sturdy, perfectly-sized inserts hold dowels securely, ensuring organized storage and minimal chance of damage during shipping. Updates for our Husky Dowels are also in the works -- new secure packaging will eliminate the opportunity for product damage in transit. These links are only viewable from emailed newsletters. To view, please join our mailing list to receive our newsletters as they become available. Q: Can I apply polyester Repair & Build-Up Materials on paint? A: Polyester repair & build up materials can be put over paint, but the bond is only as strong as the bond between the paint and the metal. It would be best to sand down to the bare surface and paint over the polyester repair paste, as it adheres well to metal. Q: I tried a 2-part mold with Freeman 1040, and the rubber would not set up where the two parts touched. What is happening to my mold, and how can I fix it? A: Because the rest of your mold set up correctly, the first half of your mold has most likely not outgassed completely, causing the curing inhibitions. Either wait 48 hours before pouring the second half, or place the first half in the oven at approximately 100°F for a couple of hours to accelerate the outgassing process. has quick info & immediate ordering capabilities. PLEASE NOTE: Our Members Only portal has been temporarily down while we complete a significant upgrade to be launched later this year. Read past issues and Q&A in the archives. As always, our website features additional resources such as TDS, MSDS, and more for all of our products. Thank you for subscribing to our newsletter. We look forward to the next opportunity to service your material needs.